added capture audio from specific playback device. added support unicode, now the audio device, audio input pin , playback device can display unicode. added GetPlaybackDeviceCount method, Return the count of Playback Device. added GetPlaybackDeviceName method, Return the name of specific Playback Device. fixed when call Start method, display waveform window flicker issue. fixed add audio pitch effect , cannot save to mp3 issue. added PlaybackDevice property. capture the audio from specific playback device. changed CaptureSpeaker property to CapturePlaybackdevice. updated VB6, C# 2010, VB.NET, VC sample. 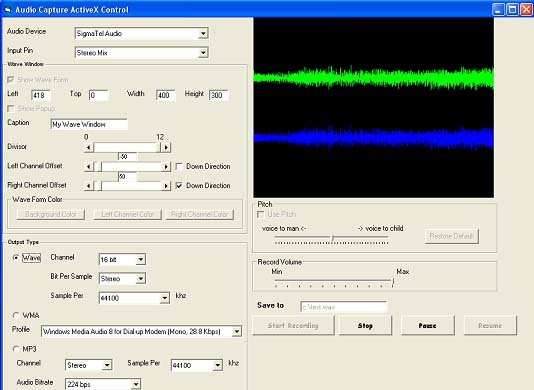 added Allow capture audio to sample grabber. 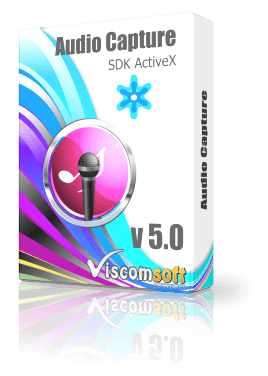 added Sample grabber vb 6 sample, it show you how to received the each audio frame and save to wav file. added Allow display waveform with left, right channel. added SetWaveWndOwner, SetWaveWndPopUp, SetWaveWndBgColor, SetWaveWndCaption, SetWaveWndColor, SetWaveWndDivisor, SetWaveWndOffset, SetWaveWndPos, SetWaveWndStyle, GetContainerWndHandle methods. rewrite mp3 ecnoder that support change sample rate, mono and stereo value. added reset the system audio inputpin after end of recording. added audio pitch function that allow change the audio pitch to male, female child voices. added refresh audiopin after selected another audio device. added adjust recording volume level.